This program reviews the three main record groups you are likely to use when doing genealogy research in England: Census records, Civil Registration records and Church parish records. Each of these record types covers a different time period ranging from 1538 to the present, and each can provide key information about your ancestors in England. The program will compare the different types of records with illustrations of the content, historical context, and some websites to access them online. A printed handout, with bibliography, is provided. This presentation will focus on location finding aids to help you find the places in England where your ancestors lived, including maps, gazetteers and websites. The talk will include demonstrations for using specific websites that are helpful in researching place names and counties in England. A printed handout, with bibliography, is provided. David Flint has been doing English genealogy research for the past 15 years. He was born in England, where he lived until the age of ten, when his family moved to Canada, and then to the United States. He currently lives in Irvine with his wife, Nancy. David devotes time to genealogy research, attending lectures and seminars, teaching genealogy classes, and occasional speaking engagements. 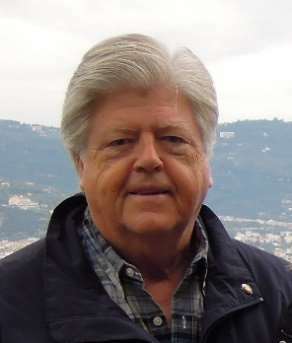 He is Past President, Vice-President and Treasurer of the South Orange County California Genealogical Society (SOCCGS) where he currently serves on the society’s executive board. David retired after working for the County of Los Angeles for 40 years, ending his career as Assistant Director of the Los Angeles County Public Library. He began his interest in genealogy at a library conference in Phoenix, Arizona in 2002, where he met two British Isles research specialists from FamilySearch. He likes to say that genealogy found him because he wasn’t looking for it at the time. He enjoys cooking, good wine, travel, and likes to read history and historical fiction. In addition to working on his family history, David is developing a specialized collection of British Isles reference books in his home library. He and his wife Nancy have made trips to England to keep in touch with family and visit the country where he spent his childhood. At his home society in Mission Viejo he leads a monthly England special interest group, and a monthly Legacy Users Group for SOCCGS members using the Legacy Family Tree genealogy program. He also teaches a beginners class for Legacy, and a class in computer basics. He leads an annual week-long research trip to the Family History Library in Salt Lake City for SOCCGS, and is currently planning their 2019 trip. Imagine being adopted and not having any information about your birth parents because you were abandoned as a baby. Becky and Tina will take you on a journey of DNA and genealogy research to find the biological parents of Daniel. Together with a DNA expert and the inclusion of Daniel’s help, this mystery was solved. How do you start with nothing but DNA matches to come to a conclusion? Come to the February meeting to find out. Christina “Tina” McKillip is a native of Lynwood and lives in Long Beach. She has been doing family research for 30 years after being intrigued by her own mother’s estranged family. In the early 1990s she did a birth parent search for a coworker and found that this type of research was very rewarding. After 25 years of doing adoption research, the power of DNA has made these searches more accurate and sometimes easier to solve. Tina recently solved a 20-year-old case that would have been impossible if not for DNA. As far as education, Tina relied on genealogy meetings, her curiosity and tenacity and the help of her various mentors in the adoption search community. Lately she has teamed up with Becky Moore and a few researchers to help adoptees who are searching for their biological families. Tina also has her own business of viewing and extracting vital records in Los Angeles County for various clients. Becky Moore intuitively knew the man raising her was not her biological father. The path to discovering who her biological father was began with very little information and pre-internet. Finally, at the age of 37 after spending hours, reading, researching jumping over hurdles, and contacting agencies, Becky found her dad, living mere blocks away from her and thus began her passion for locating biological family members. Becky is very resourceful, possessing a wide base of knowledge to draw upon. She is observant, creative, detail oriented, dependable and can do anything she sets her mind to. In addition to being a self- motivated, she works efficiently, effectively and competently. Becky believes meeting Tina in court, while on Jury Duty was part of a divine plan from a higher power. Their passion for connecting families has intensified with the discovery of DNA testing, the use of multiple databases and most importantly teamwork. Together they are dedicated, and very committed to finding the missing link, for adoptees and biological family. Genealogists encounter all sorts of handwritten documents that are difficult to read. Paleography is the art of reading old handwriting. The principles of paleography are easy to grasp, and excellent tutorials can be found on the internet. The same principles apply to the problem of reading bad handwriting from all periods. The real work consists of studying enough samples of various handwriting styles to be able to read them fluently. We will present examples of English and American handwriting from a variety of sources and periods. Bring your own favorite examples of illegible genealogical documents, which we will discuss during the program as time permits. John McCoy is Past President of Questing Heirs Genealogical Society in Long Beach, CA. He has well over 50 years of research experience covering six centuries and many countries. Since 1994, he has devoted most of his efforts to his French and Swiss ancestry. He is site coordinator for the Swiss Canton of Vaud in the World GenWeb project (www.rootsweb.com/~chevaud). Come and share one of your favorite dishes with your Questing Heirs friends at our annual potluck. In December, we will gather to install our new QHGS officers, share stories and eat great food. For the potluck, please bring a dish corresponding to the first letter of your last name. Plates and utensils will be provided. After dessert is served, we will install our new officers for 2019. We will end our meeting with Genealogy Bingo. If you have not yet participated in this QHGS phenomenon, you are in for a treat. First on the agenda is our annual meeting, where members will elect new officers for the coming year. After that, we will be celebrating our ancestors who served in the military and what information we have found on them. Some of this information was recently found in the National Archives in St. Louis by two of our members who visited there this summer. Not only is the information different for each vet, but each presenter will be free to present it in their own way. For some servicemen, we may learn something about them from before or after their service or hear of unique training that they had. Where were they sent? Were they in a conflict zone? Did they share their stories when they returned? Maybe something will be said to give you a new idea for expanding your own research. Since this sharing session will be open to all members and to give everyone time to speak, please contact Christine Elia at QuestingHeirsTreas@gmail.com with how much speaking time you think you will need by November 11, Veterans Day! I have been involved with genealogy in researching and writing family stories for over 35 years and was privileged to work as a genealogist for the first season of the PBS Genealogy Roadshow program. Currently, I belong to several genealogical organizations and societies, as well as having served in the past for the Southern California Chapter of the Association of Professional Genealogists and the Orange County California Genealogical Society. Over the last 9 years, I’ve spoken on various topics for different groups in California and New Mexico. My loves, in addition to public speaking, include history, writing, and traveling. I especially like seeing how individual family stories fit in and make up the fabric of history. “Native American Research” addresses looking at your Native American ancestors, including DNA’s role, identifying tribe, and finding records. Examples of record groups and how to use them are given. “What Do You Do When Your DNA Doesn’t Match Your Paper Trail: A Case Study” follows the steps Linda took when she discovered through DNA that her husband’s ethnicity wasn’t what they thought it was. Even though this is one family’s story, it should have ideas for anyone who finds themselves in this situation by touching on DNA and how a case is pursued.